Eighteen-year-old Viktoria Kuzmova is no stranger to the winner's circle in ITF Pro Circuit events, having collected eight titles at the $10,000 level in the past two years. The Slovakian, fresh off an appearance in the final of the US Open girls championships in New York, went to Lubbock, Texas this week, while working her way west and eventually to Australia. 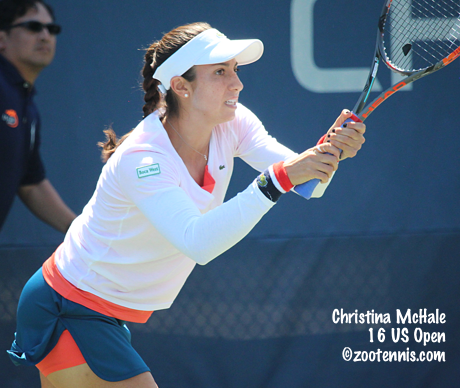 That schedule proved beneficial when she won her first pro title at the $25,000 level today, with the No. 2 seed beating No. 5 seed Freya Christie of Great Britain 6-0, 7-5 in the final. Top seed Elise Mertens of Belgium won the $50,000 USTA Pro Circuit event in Atlanta, beating Melanie Oudin 6-4, 6-2 in the final, played indoors due to inclement weather. At the WTA International tournament in Quebec, Lauren Davis lost in the final to 19-year-old Oceane Dodin of France 6-4, 6-3, but Davis will return to the WTA Top 100, while Dodin will enter it for the first time. Overnight in Tokyo, Christina McHale claimed her first WTA title, winning five consecutive three-setters, including in the final over 20-year-old Katerina Siniakova of the Czech Republic, 3-6, 6-4, 6-4. The 24-year-old from New Jersey will move back into the WTA Top 50 with the title. None of the US men in USTA Pro Circuit finals today were victorious, with qualifier Evan Zhu falling to Sebastian Fanselow of Germany 7-5, 6-7(3), 6-3 at the $10,000 Claremont Futures and Ernesto Escobedo going down to qualifier James McGee of Ireland 1-6, 6-1, 6-4 in the ATP $50,000+H Challenger in Cary, North Carolina. Unseeded Austin Krajicek and Stefan Kozlov also lost in today's doubles final in Cary, to the Canadian team of Peter Polansky and Philip Bester, seeded No. 2, 6-2, 6-2. For more on Zhu's run to the final, see this report from yesterday by Steve Pratt, the tournament press aide. Connor Smith, the No. 3 seed, won his second consecutive $10,000 Futures title in Israel, defeating No. 4 seed Neil Pauffley of Great Britain 6-1, 6-0 in the final. The former Ohio State standout has lost only one set in his ten wins the past two weeks, in the first round this week against 16-year-old Danny Thomas. Thomas and Smith won their second straight doubles title this week, beating Nathaniel Lammons and Dane Webb in the final, 6-0, 7-6(3). Thomas and Smith have not lost a set in their eight victories on this trip. At the ITF Grade 5 in Honduras, 15-year-olds Tyler Zink and Jordan Harris came away with titles, and did it without the loss of a set. It was the first career ITF junior singles title for Zink, with the No. 3 seed taking out unseeded Alan Sau Franco of Mexico 7-5, 6-1 in the final. The unseeded Harris, who won her first ITF title last year, defeated top seed Rut Galindo of Guatemala 6-4, 6-1 in the final. Alfredo Casso partnered Pedro Gutierrez Arreaga of Guatemala to take the boys doubles title. The Porsche Napa Valley Classic finished today, with Baylor sophomore Jimmy Bendeck winning the shootout that earns him a USTA Pro Circuit wild card. Below are the shootout results. None of the eight USTA players invited to compete with the collegians qualified for the shootout. Complete results can be found here. The complete round robin draw is here.